Starvalleyweather.com was developed 0ver 8 years ago. It has been gradually improved over that time. Some of the links have been changed. StarValleyWeather.com is the combined creation of three Johns. While the idea began with me, John (Jack) Hales a retired Severe Storms Forecaster who now resides in Star Valley Ranch, the actual development of the web page was the work of John Hart(current Severe Storms Forecaster in Norman OK at the Storm Prediction Center and John Hales the son of Jack who does web development for a living and resides in the Phoenix AZ area. The primary goal of the web page is to provide the residents of Star Valley and its surroundings, along with any visitors or interested persons, one stop shopping for all the weather information they may need for a myriad of purposes. Star Valley, due to its location with respect to several mountain ranges and in the path of many of the storms that cross the country along with its rather high elevation, poses a real challenge to anyone attempting to forecast its weather. Knowing that I (Jack Hales) would be retiring to a home we built in Star Valley Ranch, and with a life long passion for the understanding of weather, I was able to aid in the establishment of three weather stations in Star Valley in 2010. They are located at Thayne and Etna Elementary schools as well as in the Town of Star Valley Ranch. They have provided more or less a continuous weather record since the Fall of 2010. The stations are built by Davis Instruments and have been and continue to provide their data online. A primary purpose of the weather stations at the schools is to stimulate student interest in not only weather, but science in general. The school stations were funded by the Student Loan Fund of Idaho. All Three stations observe temperature, humidity, winds, pressure and both frozen and liquid precipitation. The Thayne Station has additional sensors that measure soil temperature and moisture at three depths: just below the surface, 2 feet and 4 feet deep. The Thayne station also measures both solar insolation and UV levels. 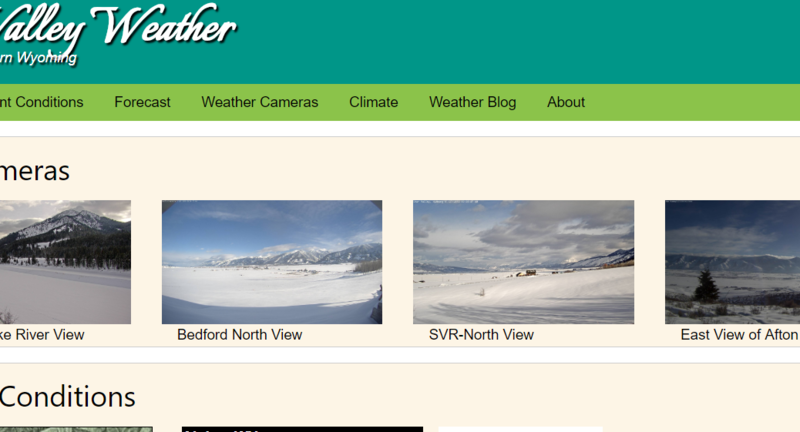 There are several links on the Home Page pointing to areas of interest with regards to Star Valley Weather. The Weather Cameras Link is unique and has been under development by my son, John Hales for the past ten years. There is a link on the many capabilities the site has with regards to viewing a large number of live web cams not only in the Star Valley, Western Wyoming area but many other regions as well. You are referred to the link for directions on how to use the site. There are links to weather information including not only forecasts issued from the Weather Forecast Office in Riverton, WY but other types of more numerically derived prognostic tools. Also available are both radar and satellite data and surface observations. One other area of interest is my weather blog. The blog will evolve with time. But the primary goal is to focus on weather forecasting and observing in and around Star Valley WY. It will provide a means of enhancing the flow of weather info, particularly during periods of hazardous conditions both winter and otherwise.